An additional charge for midnight movies and "advance premieres." Special pricing applies to 3D and other special engagements. Effective April 5, 2013: Matinee pricing will apply to all movies starting before 4PM (Friday through Sunday) and all movies starting before 5:30PM (Monday through Thursday). *Senior "Young at Heart" pricing will remain in effect until 5:30PM on Fridays. 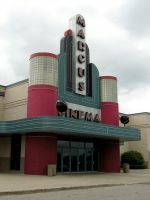 This movie theater is near Menomonee Falls, Menomonee Fls, Rockfield, Germantown, Lannon, Milwaukee, Colgate, Lisbon, Sussex, Butler, Hubertus.